The Pro 6 has a redesigned interior for improved cooling, allowing Microsoft to offer eighth-generation quad-core Intel processors as well as 13.5 hours of battery life. The tablet is said to be 67 percent faster than its predecessor. The device has a 12.3-inch display, and can be configured with up to 16 gigabytes of RAM. It will go on sale in black and platinum colors, starting at $899 for a Core i5 model. The Surface Laptop 2 is claimed to be 85 percent faster thanks to eighth-gen Intel processors, and have a quieter keyboard, but is otherwise unchanged with a 13.5-inch display and 14.5 hours of battery life. The most important difference compared to the first Laptop may actually be price, since the cheapest model will be $100 less at $899. Microsoft's new all-in-one desktop, the Surface Studio 2, is headlined by an improved display that's 38 percent brighter with 22 percent more contrast and support for tilt functions with the Surface Pen. The computer's Nvidia graphics chip is 50 percent faster, and a hybrid storage drive has been swapped for a 2-terabyte SSD. 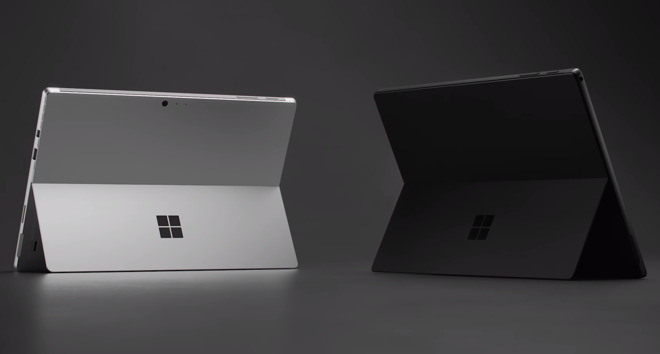 Combined with an upgraded CPU, Microsoft is touting the product as he "fastest Surface ever." Finally, Microsoft took the wraps off a pair of $350 Surface Headphones. The light gray cans feature user-adjustable noise-canceling technology that can be tuned by turning a dial on the left ear cup. A corresponding dial on the right ear piece controls volume, while four beam-forming microphones — two per ear — provide high quality voice reproduction. "Hey Cortana" voice control is also included. The Pro 6 and Laptop 2 are both launching Oct. 16. No date or price has been set for the Studio 2. Surface Headphones are due to ship in time for the holiday shopping season in the U.S.